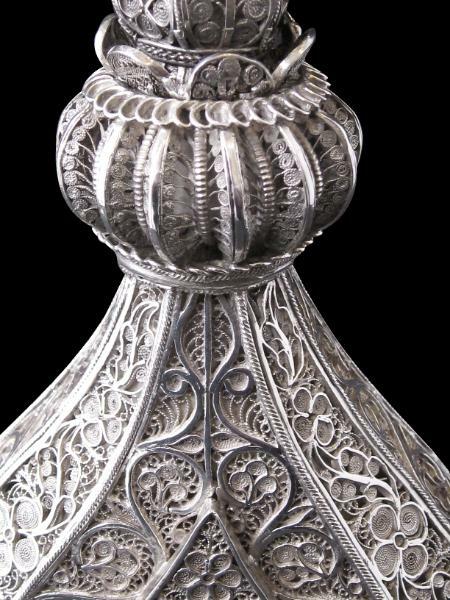 This sprinkler is the tallest sprinkler that we have seen, and unusually it is made of fine silver filigree. The head of the sprinkler comprises a remarkable profuse array of multi-petalled flowers with multiple silver stamens from which six silver spheres are suspended. The six-sided neck comprises dozens of tight filigree curts within straight borders, leading down to a prominent ribbed collar also decorated with filigree. The heart-shaped body is decorated on all sides with fine filigree and on both sides has a raised tear-shaped plaque containing a filigree tree motif. The eight-sided flared foot also is of fine silver filigree work. The sprinkler is able to hold water despite its porous filigree exterior on account of a an interior solid silver tube that runs down the neck and then splits into two tubs that follow the outer two sides of the body, leaving the central part of the body see-through. 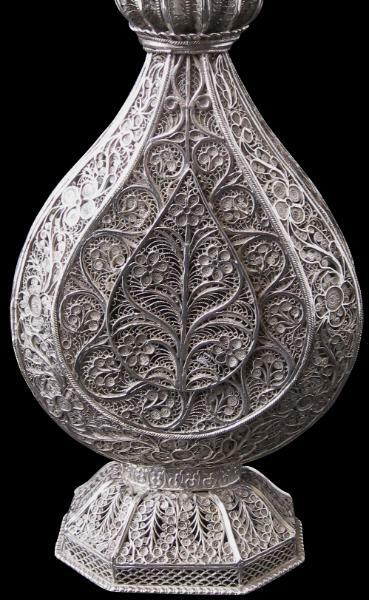 This device allows teh sprikler to appear to be completely of filigree and yet still able to function as a container to hold scented water. The sprinkler has a maker’s silver plaque applied to the inside of the base which says in raised lettering ‘KUNNYE CUTTACK’. 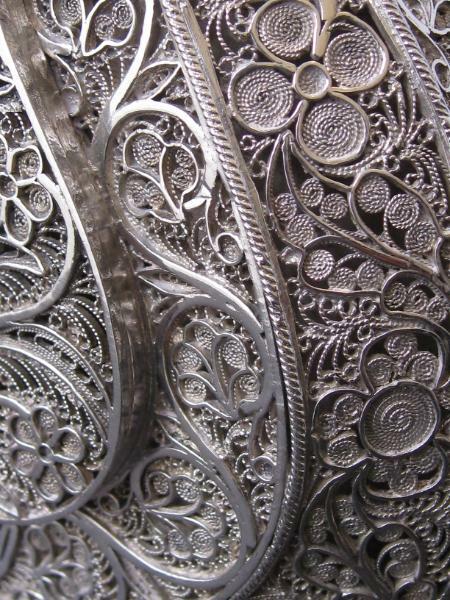 Cuttack, a city in the Indian state of Orissa, was an important centre for works in filigree silver. 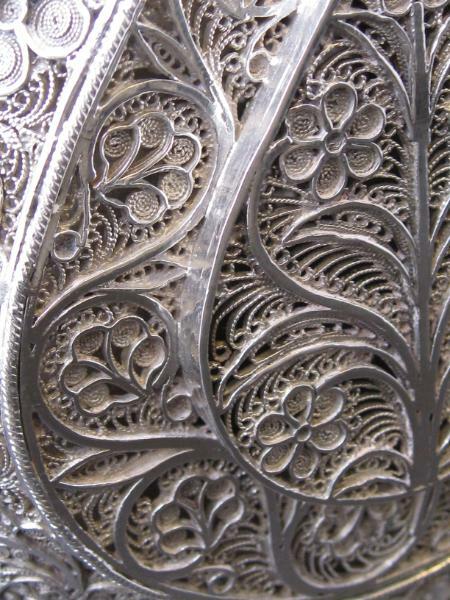 It is likely that the silver filigree technique was introduced to India in the sixteenth century by the Spanish and Portuguese. 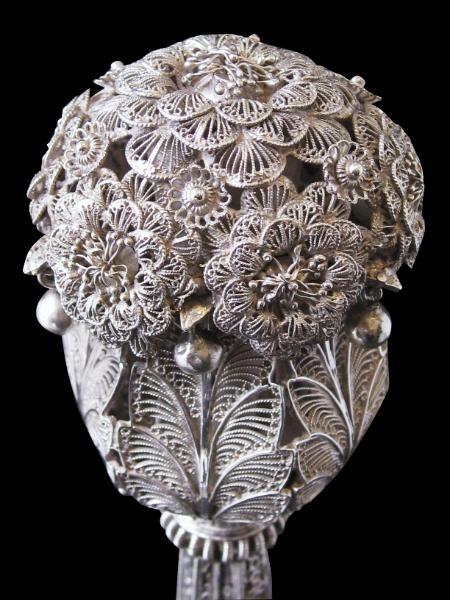 Several items of Cuttack filigree silver are held in Mumbai’s Prince of Wales Museum and are illustrated in Desai (2002). The sprinkler is in very good condition with few or no discernible losses to the filigree. Desai, K., Jewels on the Crescent: Masterpieces of Chhatrapati Shivaji Maharaj Vastu Sangrahalaya, Mapin, 2002.